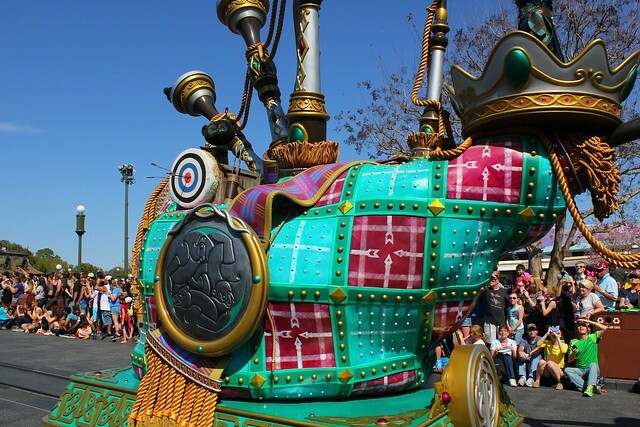 Today Walt Disney World debuted a new daytime parade for the Magic Kingdom theme park for the first time in more than a decade. 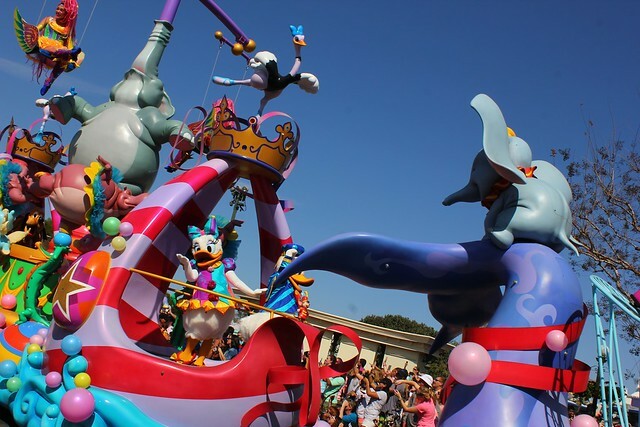 The new Festival of Fantasy Parade features classic characters mixed with today’s most popular films inspiring high-flying, vibrant floats set to a rousing new musical score. 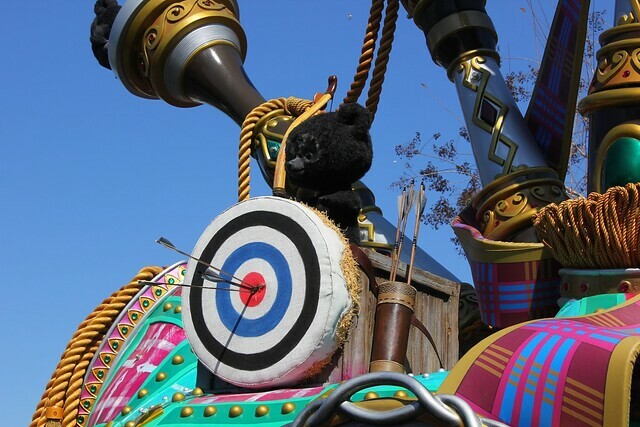 It’s a much-needed upgrade for the park, leaps and bounds better than the previous parade. 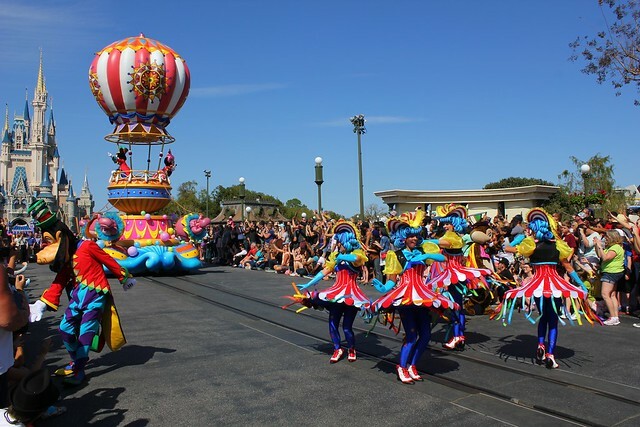 It even rivals Disneyland’s current fan favorite Soundsational Parade, quite possibly more extravagant and enjoyable in many ways. 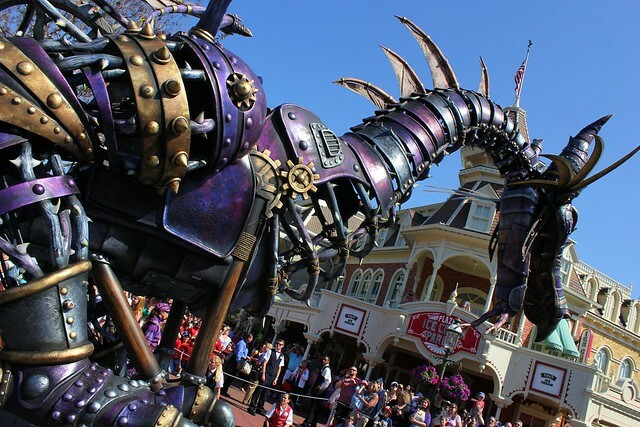 The Festival of Fantasy Parade is sure to impress all Disney fans with massive floats featuring plenty of movement, from swinging weapons from the Snuggly Duckling in “Tangled” to Olaf spinning around Anna and Elsa from “Frozen” to the increbiel sight that is the steampunk-inspired Maleficent dragon that moves its head, tail, and spits fire – evoking audible gasps from the crowd every time. 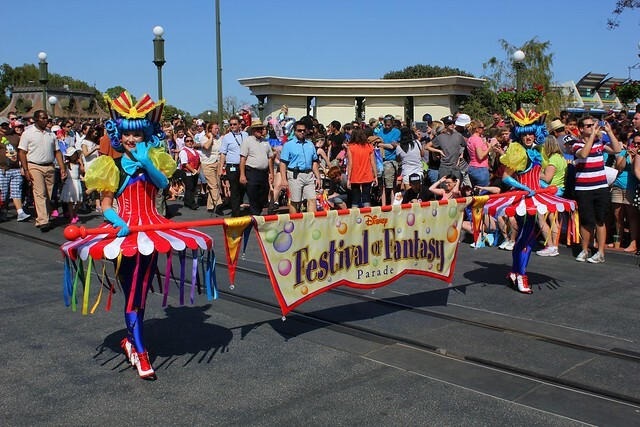 Festival of Fantasy’s music is dreamy but upbeat, perfectly accompanying the whimsical style of the floats’ designs and new colorful costumes. 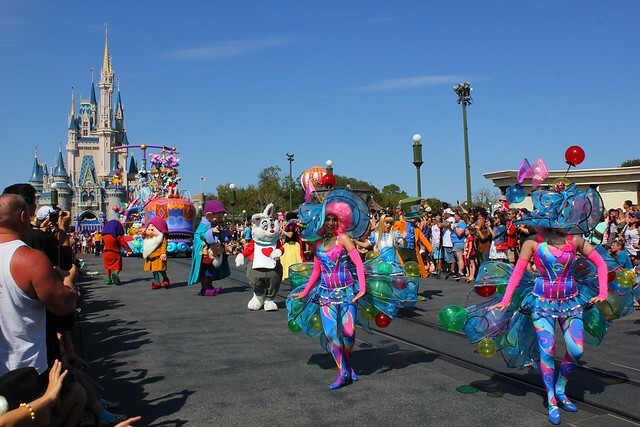 The supporting cast of performers eagerly dance along sporting eye-catching outfits while Disney’s most famous characters both wave from high atop amazingly elaborate floats and traverse the park’s streets, giving out high-fives. 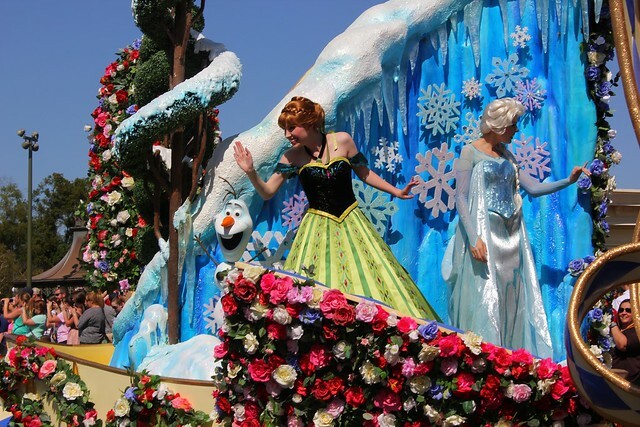 There are attention-grabbing moments throughout the parade, beginning with Princess Anna from “Frozen” showing up in her coronation dress (a Disney park debut) alongside her sister Elsa at the tail end of the Princess Garden float. 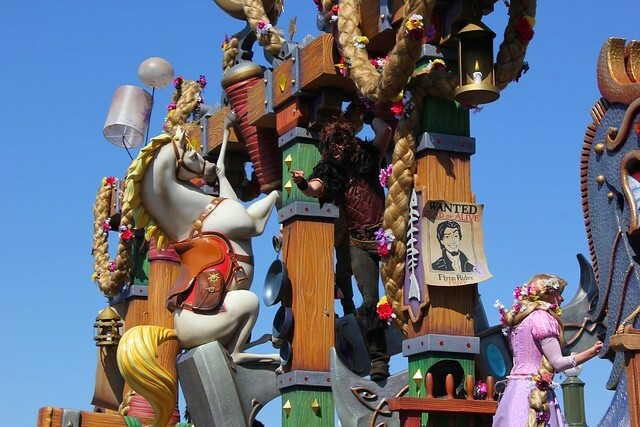 Then comes Rapunzel and Flynn Rider along with many “Tangled” characters and easter eggs hidden throughout the huge float inspired by the Snuggly Duckling – another “wow” of the new parade. And it even features a particularly hilarious (and huge!) 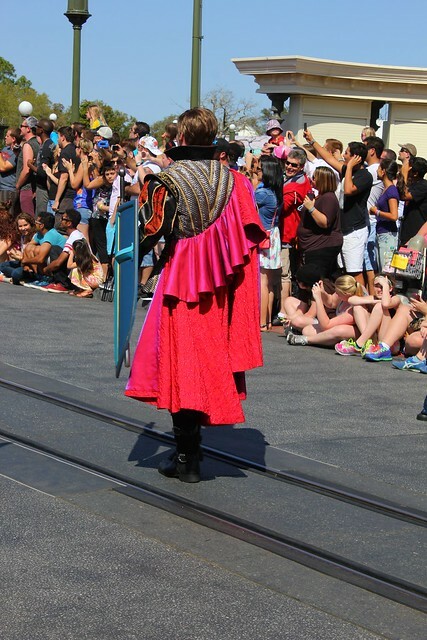 mime drawing laughs ahead of the float. 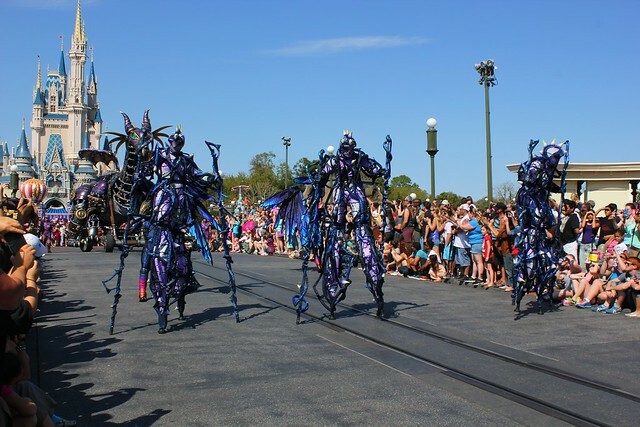 The “Sleeping Beauty” unit is unusually dark for a daytime parade, adding balance to an otherwise bright and happy performance. 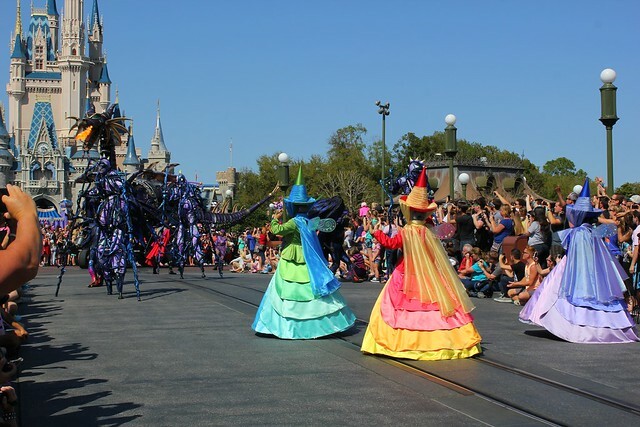 Flora, Fauna, and Merryweather wave their winds wildly with worried looks on their faces while Prince Phillip tries to fend of the giant fire-breathing Maleficent dragon along with her eerie henchmen. 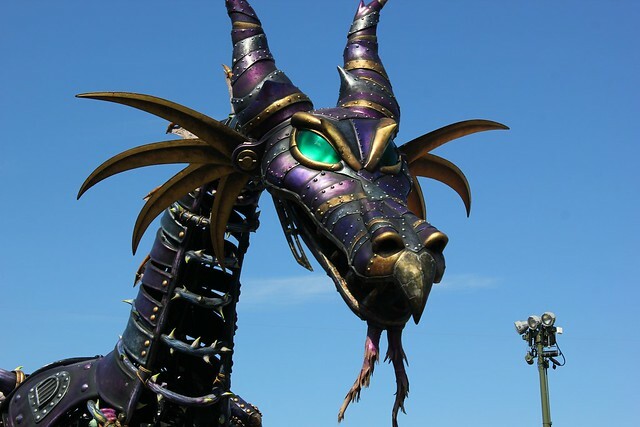 Watch out when the dragon waves its tail over guests’ heads. 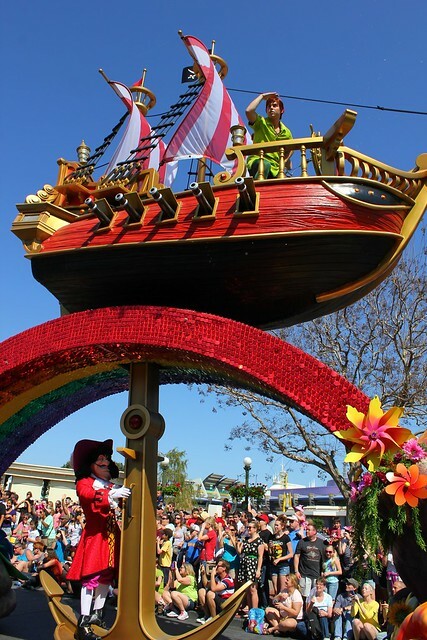 The unquestionably tall “Peter Pan” float features shooting canons atop a pirate ship while Captain Hook dangles underneath, chased by an equally huge crocodile (one of the few elements borrowed from a prior Walt Disney World parade). 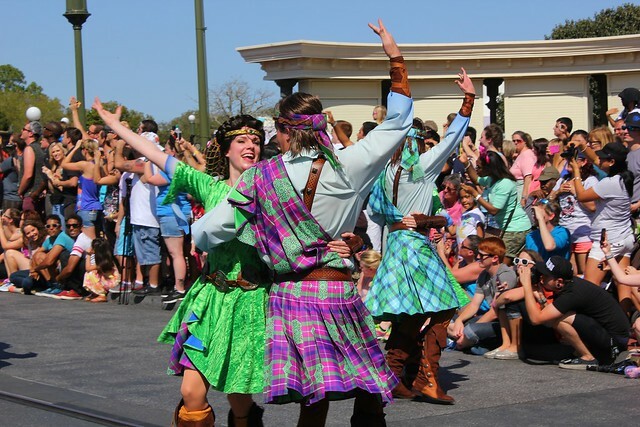 And the “Newsies” inspired Lost Boys do a great job pumping up the crowd. 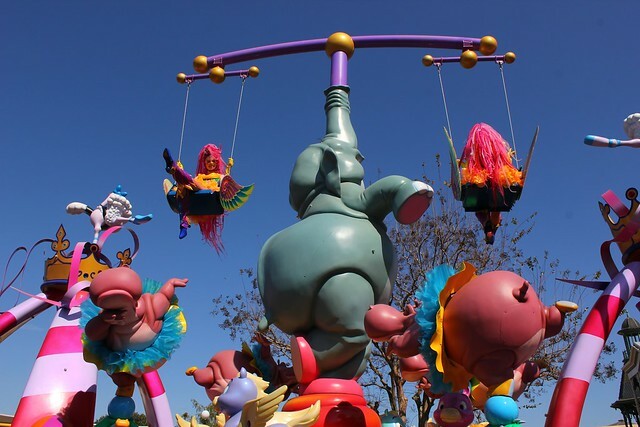 The units inspired by “Pinocchio,” “The Little Mermaid,” and “Brave” add the most splashes of color to the parade with a highly stylized Monstro leading the wooden boy down the street much like Sebastian pulls Ariel while she sits above guests’ heads on a seashell. 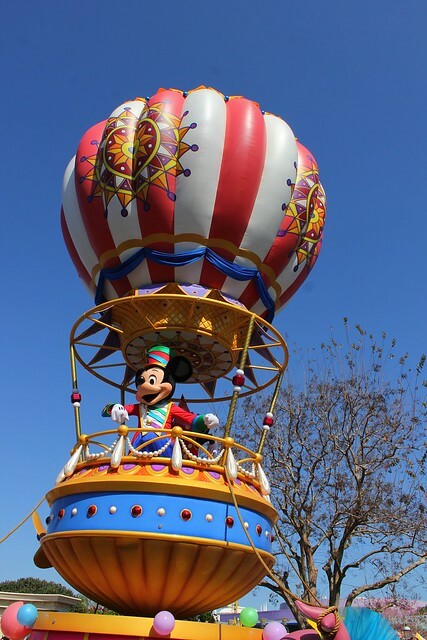 It all wraps up with Mickey and Minnie Mouse along with a cavalcade of characters, making sure everyone sees at least one favorite. 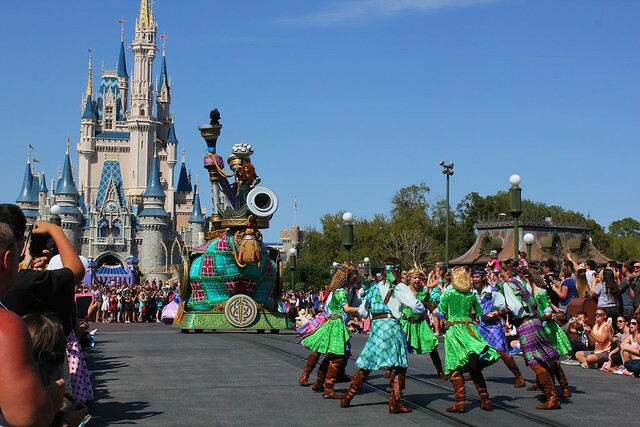 Walt Disney World has succeeded in creating a brilliant new daytime parade that exceeds everyone’s expectations and will definitely draw fans to return day after day to see it again and again. 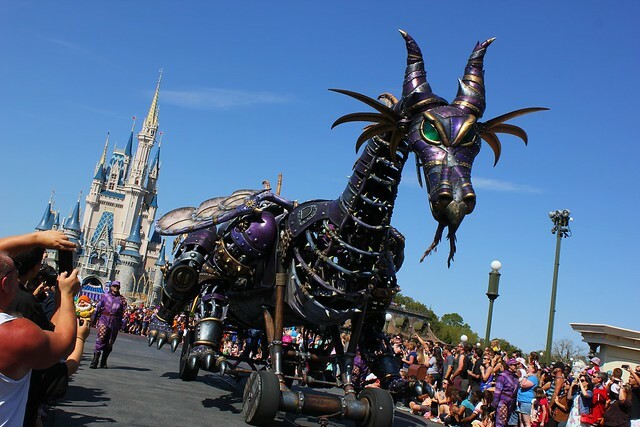 Check back to Inside the Magic tomorrow for an even closer look at the Festival of Fantasy Parade with details from some of its creators. 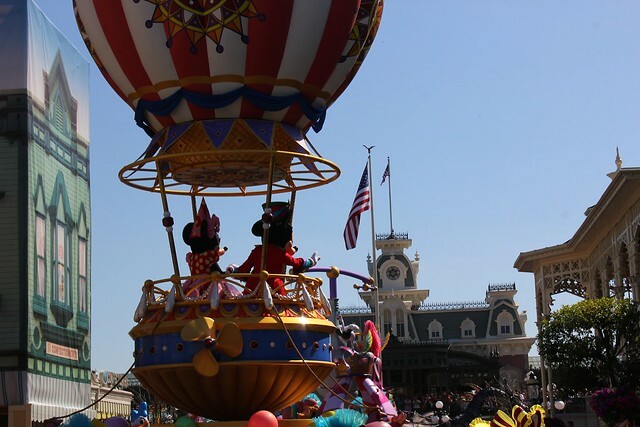 This parade definitely outshines the Soundsational Parade for me. 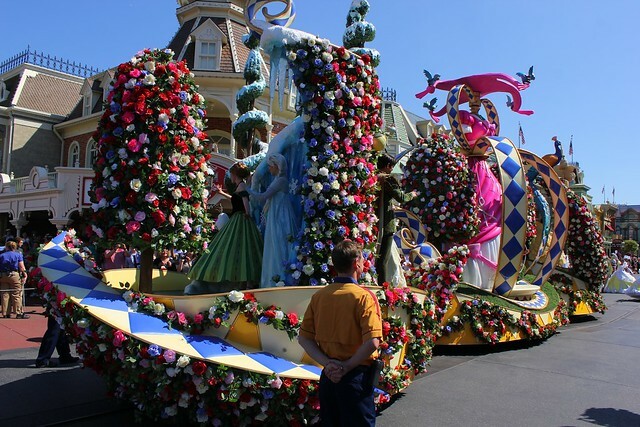 In fact, this new parade would be my favorite Disney parade if not for the old Parade of Dreams years ago. 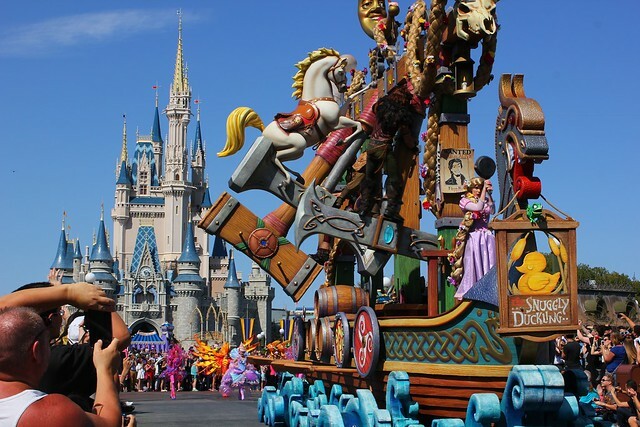 I’ll have to watch again and pay more attention to this parade’s soundtrack, but thus far Festival of Fantasy wins in terms of float design while Parade of Dreams wins in terms of music. Thanks for posting this so quickly, Ricky! I’ve been dying to see full video of it. I loved all of it, except for the Brave portion. 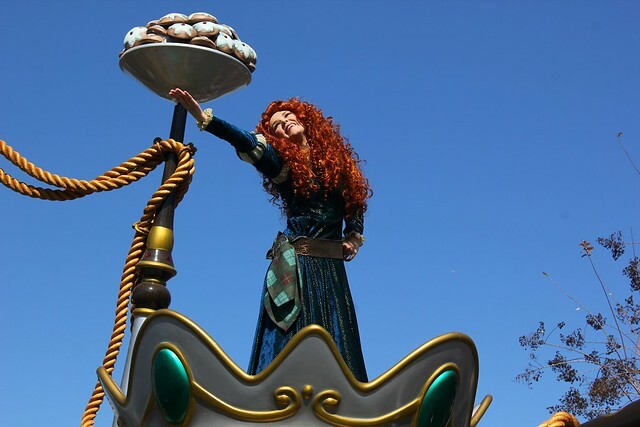 It was kind of bland compared to everything else, and I’m not really sure what Merida was doing up there. Those movements are so unlike the character. Aside from that, it was all wonderful. 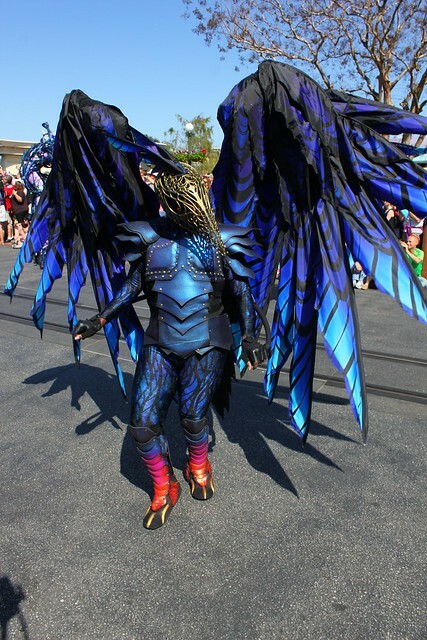 The costumes, the floats, the contrast of dark & light. 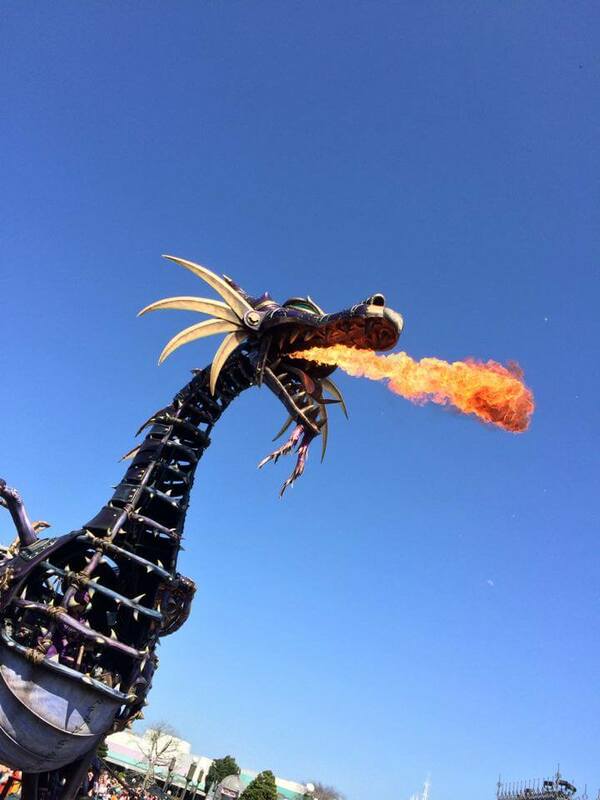 I can’t wait to see it in person this Fall. 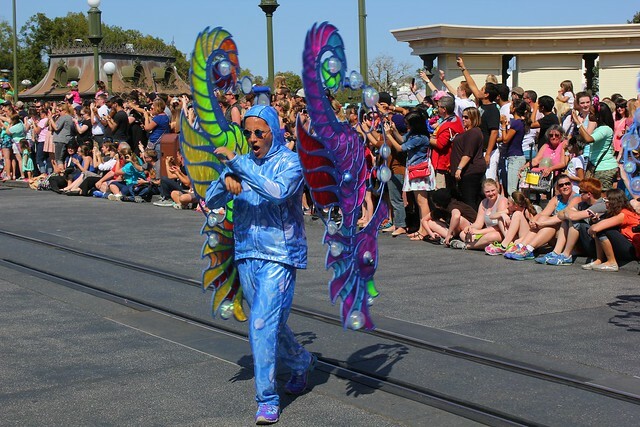 This parade only happens in the Day time. Why would it happen at night if it isn’t decorated in lights (like the current, nightly MSE is). 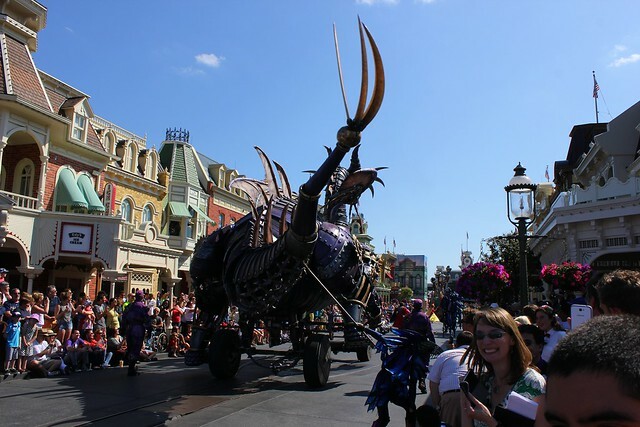 On that note, has any day-parade at a Disney park come out at night in the past? 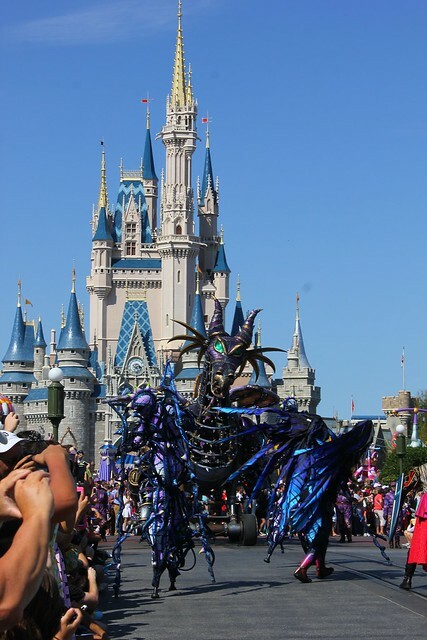 I really loved this parade! Can’t wait to see it. 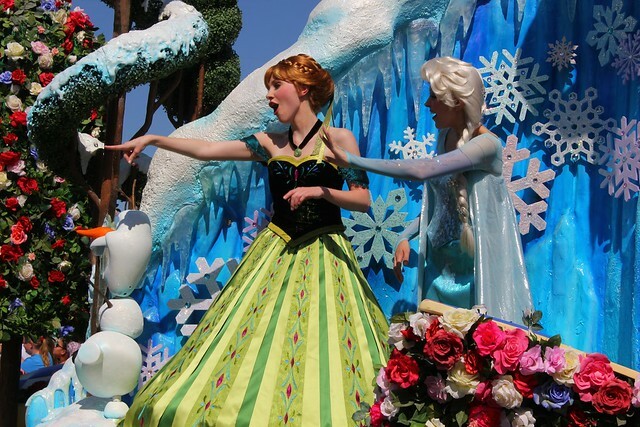 The only thing I was wondering was that I noticed in the frozen float there was a huge wall behind Elsa and Ana. How does the other side of the people get to see them? Do they just see a big wall? Thank you! Can’t wait to see it in person. 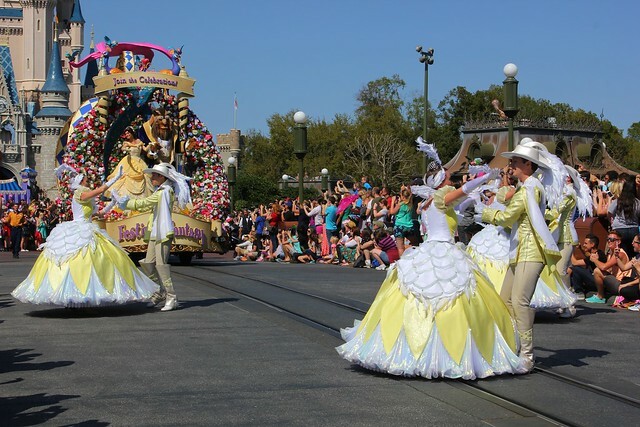 When it spins around, Tiana and Naveen are on the other side of it. So you see one side or the other as it passes by. 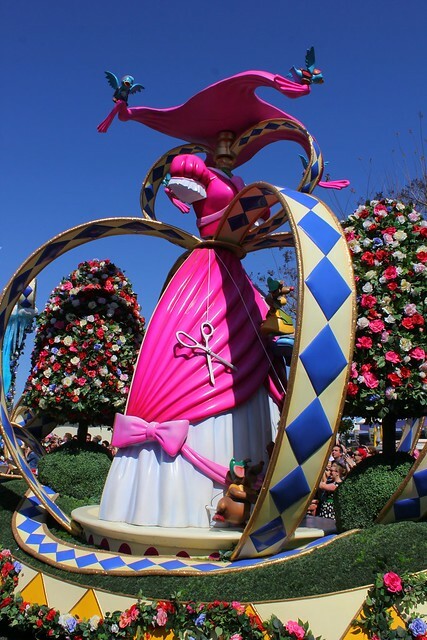 Likewise, you either see Cinderella’s big pink dress or Cinderella herself. Ooooooh. 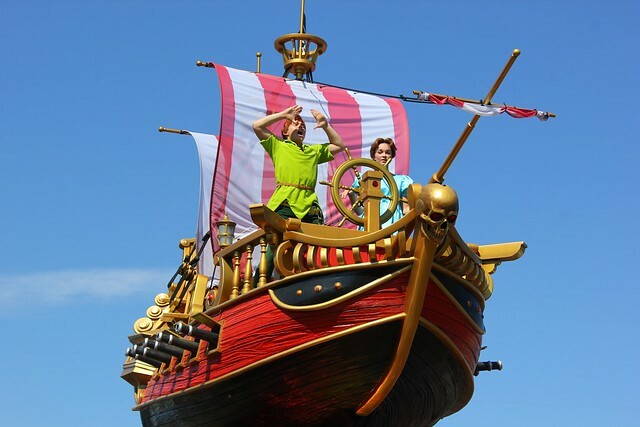 Thank you for that, I had no clue Tirana and naveen were on it. 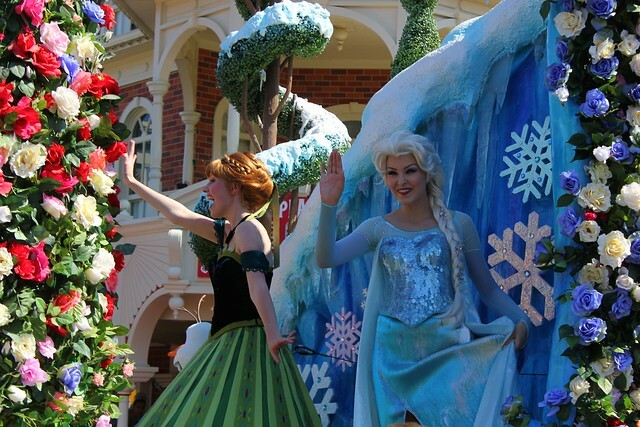 I feel like more kids would want to see Anna and Elsa. Thanks for the coverage! Keep up the great work!! Looks awesome, thanks for the great video. Wish I could have been there. Can’t here the music very well, and the position seem to be off from the current float in the video. The music does just kind of fade into the background. Even in person, it wasn’t terribly prominent. 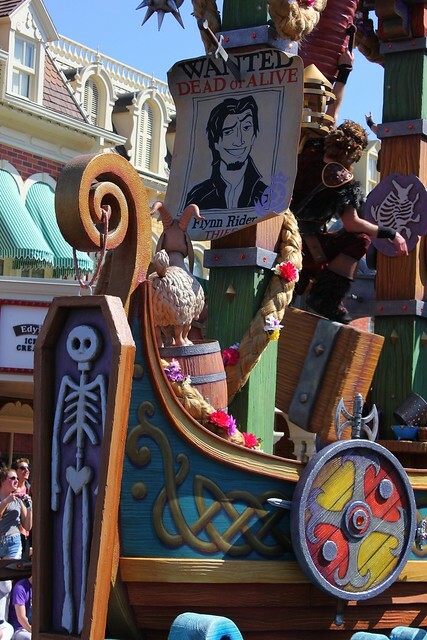 Loved this parade…. 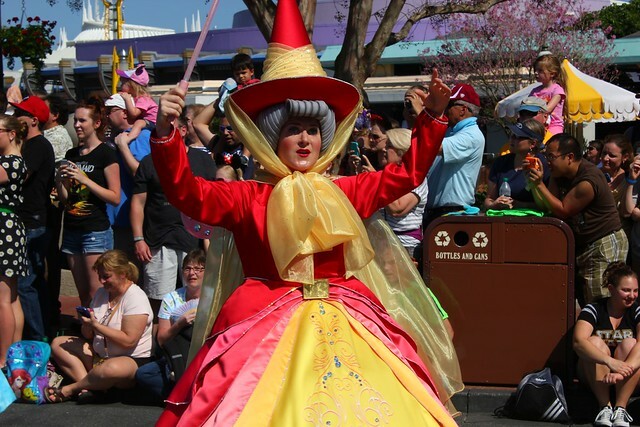 But I missed Cinerella! 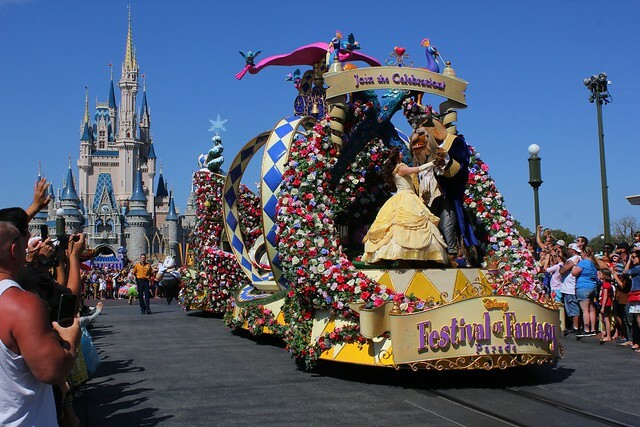 I know she was there, but Cinderells deserves her famous pumpkin carriage! If we blink we miss her! 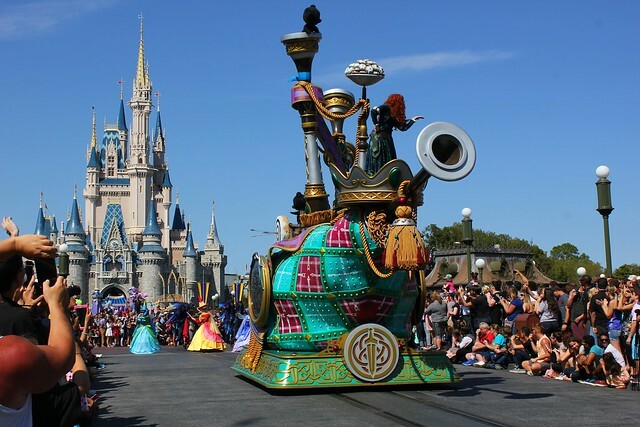 I think the parade is great, and a much needed addition to the Magic Kingdom, however, i do not think it outshines Disneyland’s Soundsational Parade. 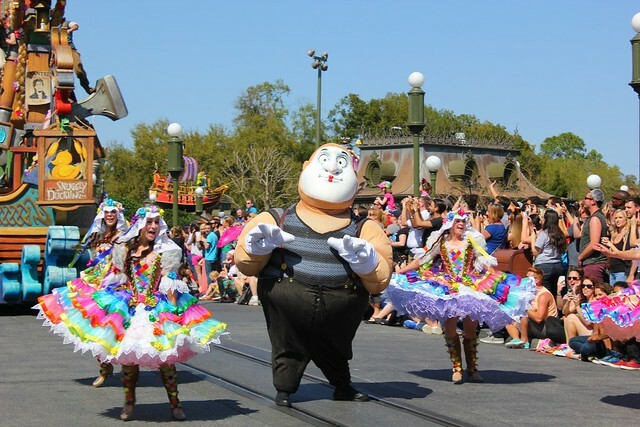 This parade just does not have the same upbeat energy that Soundsational has, the energy is much higher and everyone is clapping along and dancing along the parade route, As Festival of Fantasy is nice, the soundtrack and energy is definitely lacking for me. 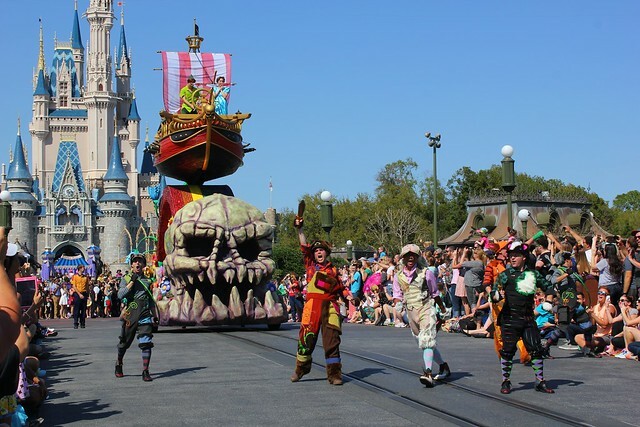 After so many years with the same stale parade, i was hoping for something a bit more. (sigh) People like you ask for too much. 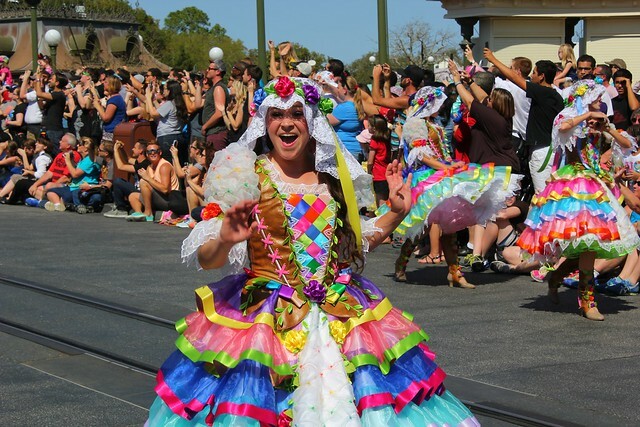 What I would say is that Soundsational is dependent on music. 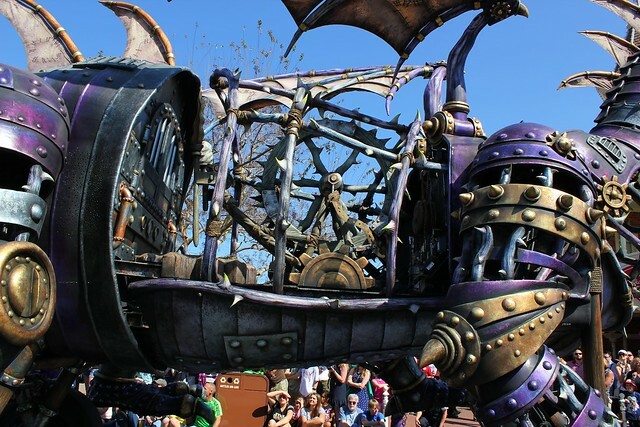 It drives the parade. 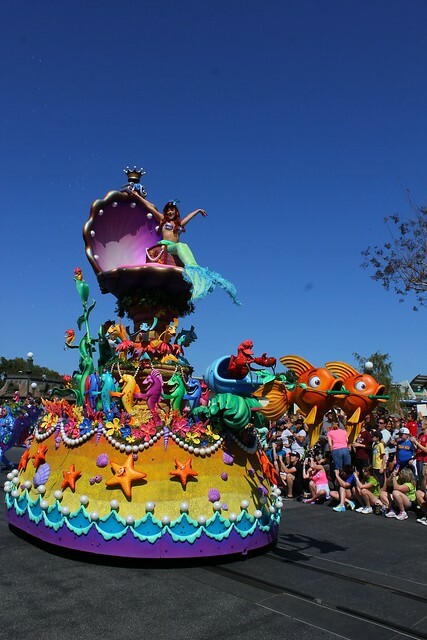 Here the floats are the main feature with a complimentary, catchy background music accompanying it. I only have one complaint! 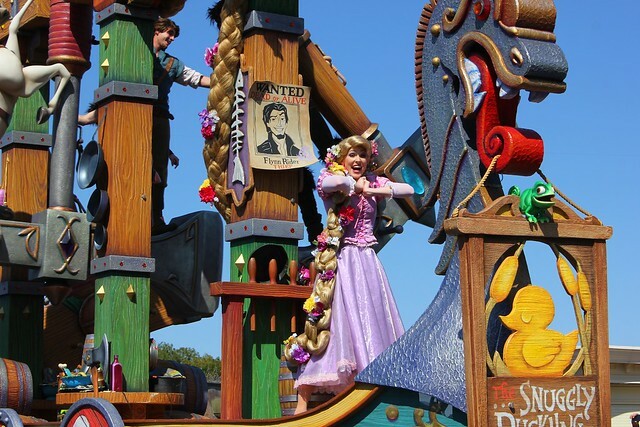 Where the heck is Princess Aurora? 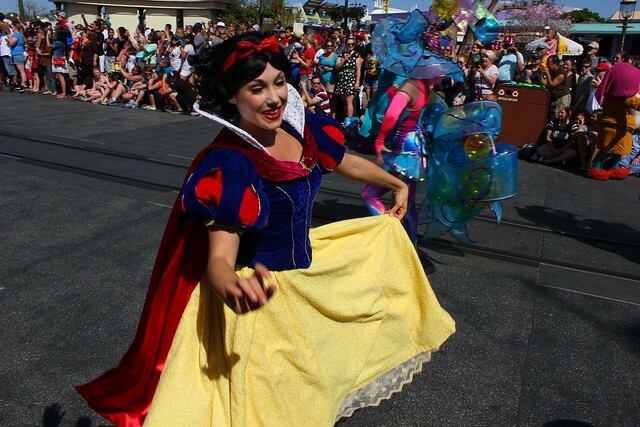 They should add her to the sleeping beauty section. 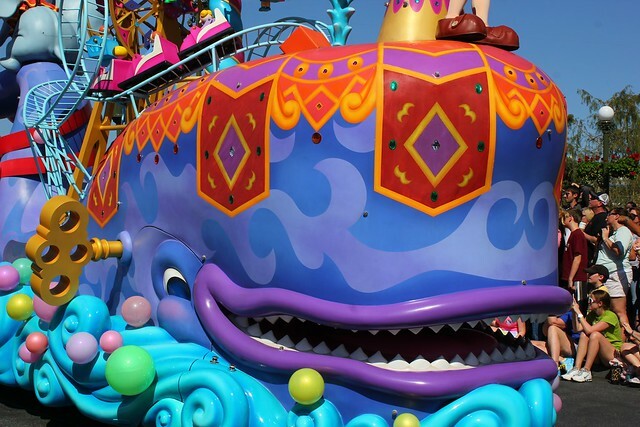 The floats remind me of the floats from Tokyo Disneyland. 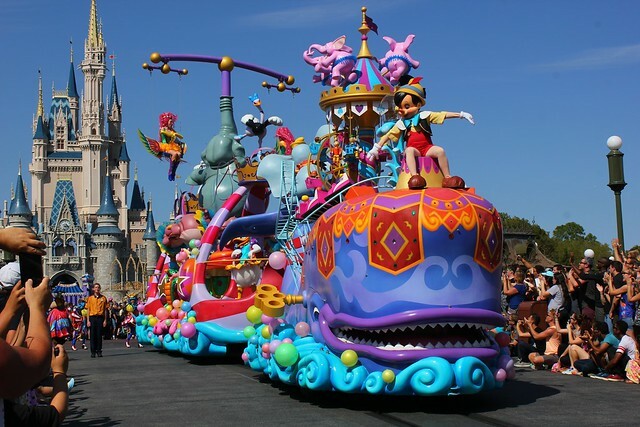 I’m so excited to see this parade when I go to Disney World!! 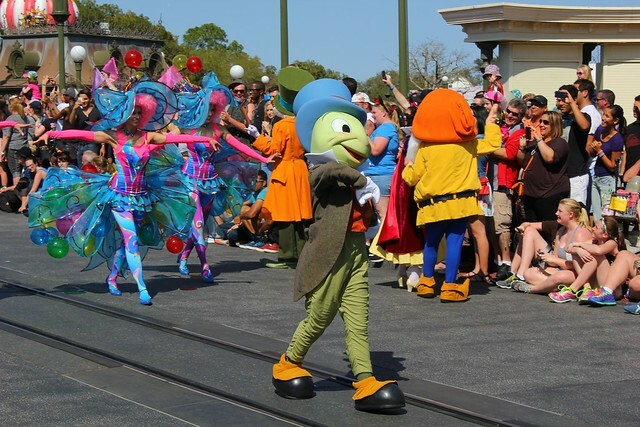 Did Princess and a Frog made 1 billion -and counting- or won any Oscars? Am I missing something? 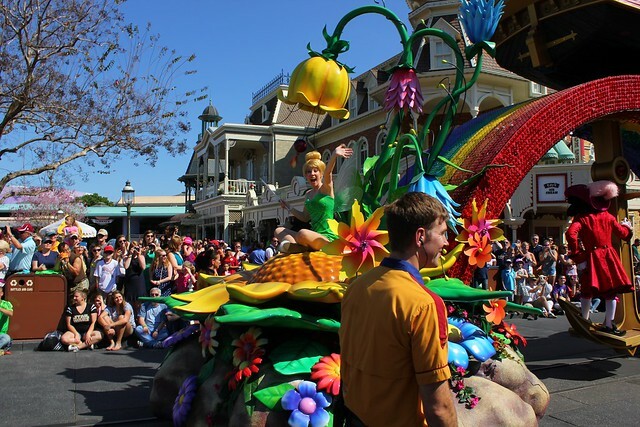 No offense to Tiana fans, but that’s a waste of prime real state in the parade. 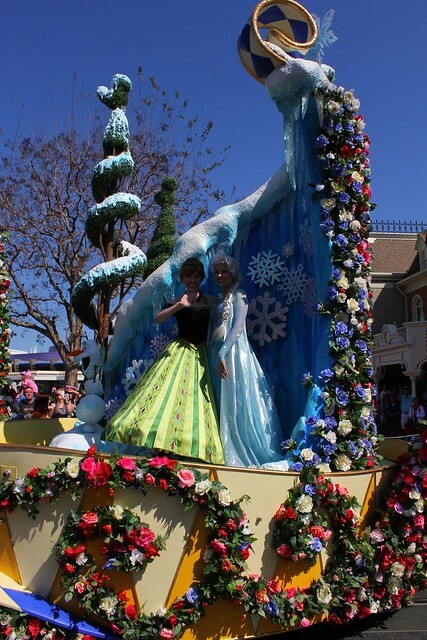 Frozen is the biggest hit since Lion King and all we get is Anna & Elsa in a rotating (good luck with your photo op!) tiny spot at the very back? Come on Parks and Recreation people! 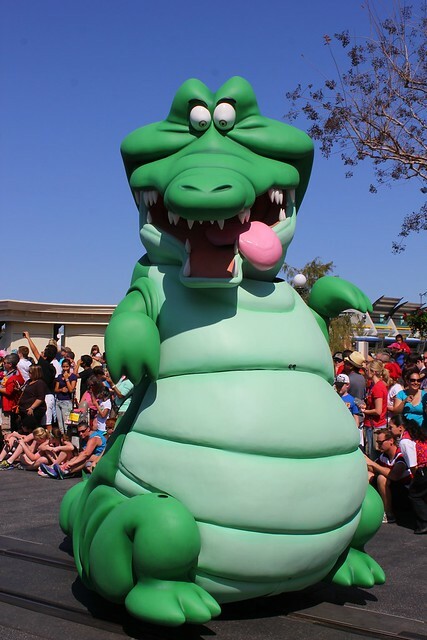 Tiana is still popular-you’ve got to remember Alice in Wonderland, Dumbo didn’t do that well but Walt saw they had good stories to tell. 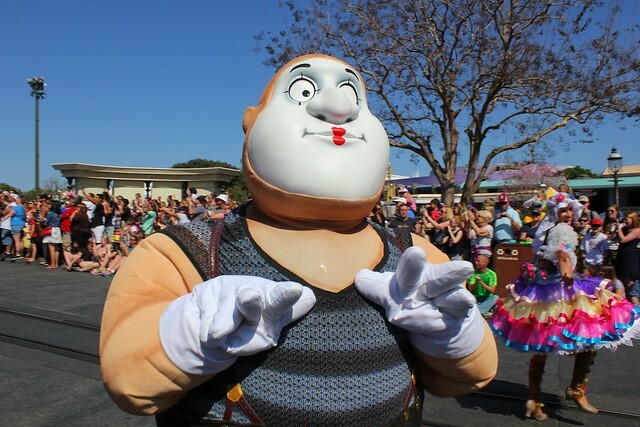 Also Frozen wasn’t supposed to be a big hit-only 500-600 million max. But they released a viral vid for let it go and word of mouth quickly spread. 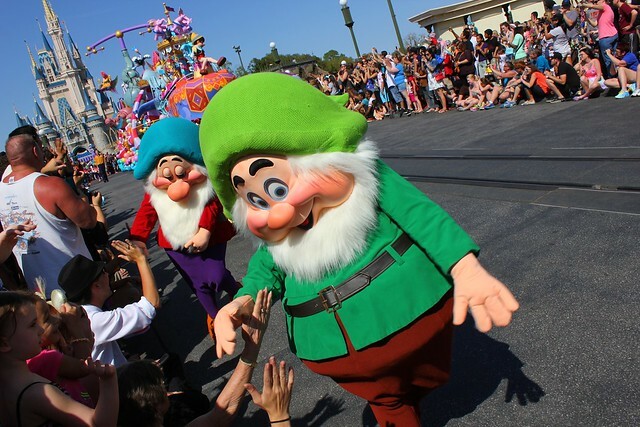 You’re lucky they’re in the parade so be grateful. It was a last minute addition and they did it really well. 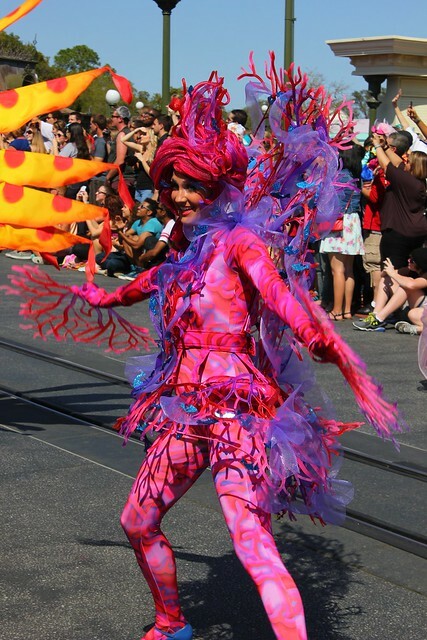 Is there any footage of the Katy High School band that was the pre-opener for the parade? If so, How can I get it? 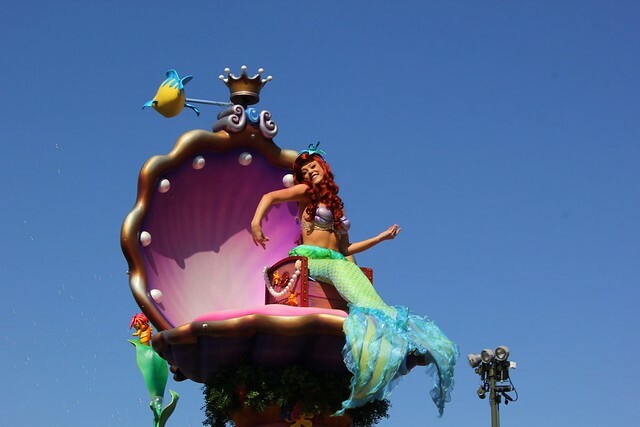 Dear Disney Characters Mickey Mouse Minnie Mouse Goofy Donald Daisy Pluto Good Night Day Hi Princess Rapunzel Merida Cinderella . 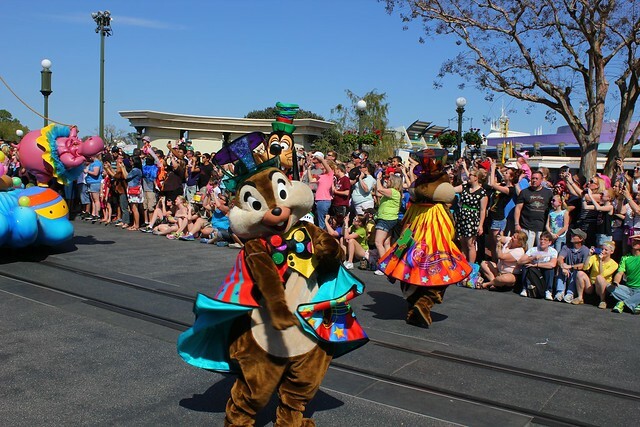 Chip Dale Jessie Belle Tinker Bell Peter Pan Alice Mad Hatter Wendy Princess Show White Mr. Smee Captain Hook Jiminy Cricket Timon White Rabbit Seven Elsa Anna Ariel Aurora Suzy Perla Tweedle Dee Tweedle Dum Princess Jasmine Mulan Pocahontas Sebastian Godmother Pinocchio Lumiere Mary Vanellope Tiana Merlin Princess Kida Blue Fairy Iridessa Fawn Vidia Rosetta Drizella Lady Treamine Anastasia Maleficent The Evil Queen Periwinkle Queen Amidala Ahasoka Tano Shaak Ti The Grinch Sally Jack Skellington Aurra Sing Asajj Venteress Sigrid Elmo Zoe Greedo Aghes Zam Wesell Gamorrean Cindy Lou Edith Guard Jo Jo Jake Meeko Terk Stitch Robin Hood Megara Jane Esmeralda Dee Dee Doodle The Doodlebops Girls and Boys Holiday Non How are you . I’ m fine. Hello is Nicholas Gist What ‘ s up? 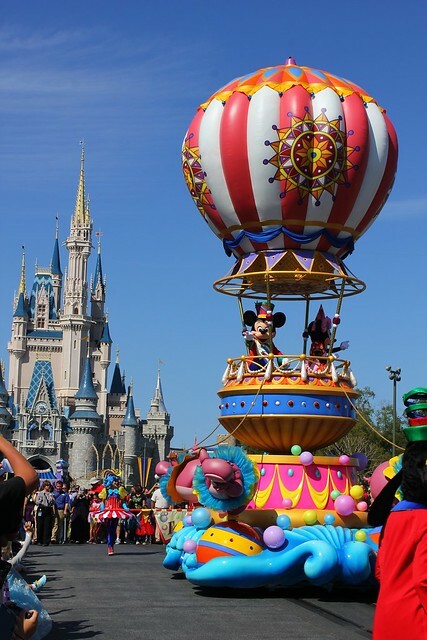 Mickey Elsa Rapunzel Tinker Bell Cinderella Wendy Darling Alice Drizella Maleficent Lady Treamine Jiminy Cricket Timon Belle Princess Merida Perla Suzy White Rabbit Grumpy Ariel Mad Hatter Peter Pan Star Wars Cruella De Vil Mr. Smee Aurora Jasmine Mary Sally Jack Skellington Terk Meeko Pocahontas Anna Anastasia Goofy Donald Daisy Woody Buzz Tweedle Dum Tweedle Dee Rafiki Seven Princess Show White Kida Faires Dopey Lumiere Sebastian Vanellope Tiana Pinocchio Genie Pocahontas Merlin Dee Dee Doodle the Doodlebops girls and boys All Characters . 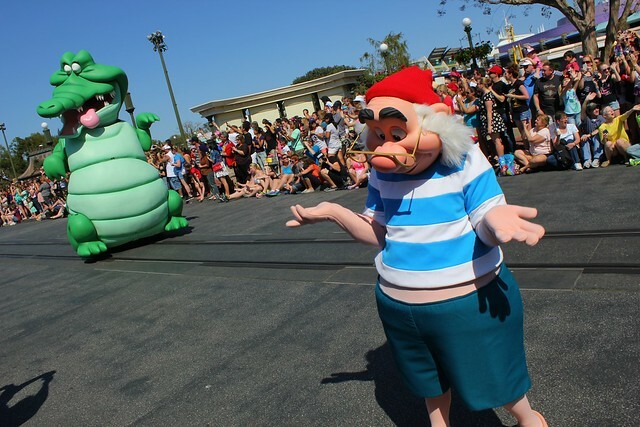 Characters The Grinch All the They His friends and Her friends Disney Characters All All the Many Characters and Trips ? 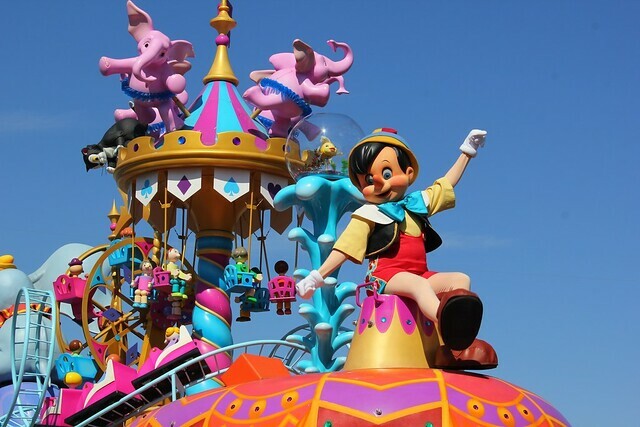 Have My Girlfriend Girl Wish to Drizella and Tinker Bell Merida Maleficent Sigrid Queen Amidala Ahasoka Tano Shaak Ti Cindy Lou Dee Dee Doodle The Doodlebops Girl Fawn Blue Fairy Godmother to Nicholas Gist for Dancing Ride in Game Walk see to Characters and Sit Nicholas Gist Jessie to watch to They His friends Mickey Minnie to Parade ? 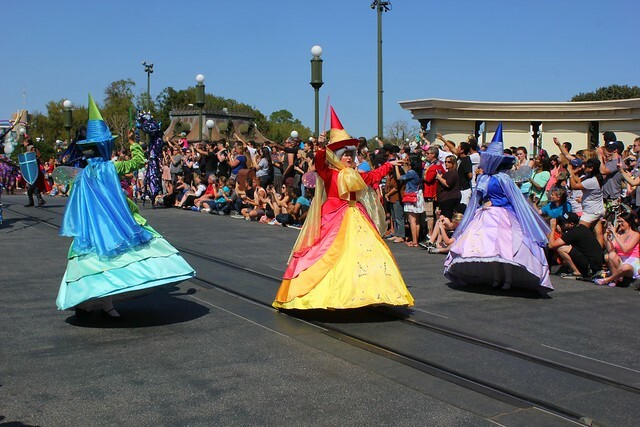 Does anyone know how the three fairy godmothers skate around so smoothly? 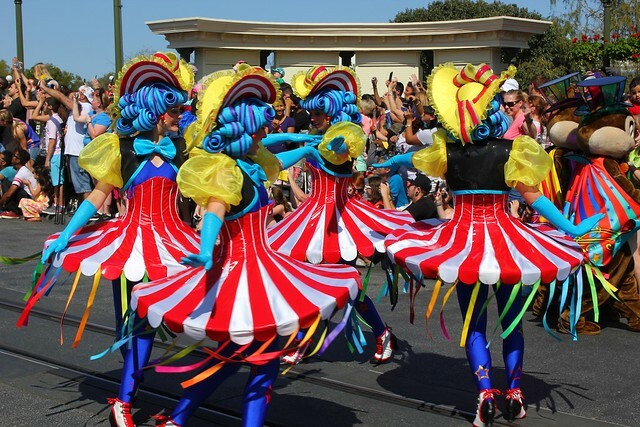 Are they simply wearing skates, or is there some kind of Segway device under their dresses?